Hello, my name is Rabina Khan and welcome to my website. Creativity really is her forte, there’s no doubt about that. How else to explain a cab fare of £120.63 for a 1.5 mile trip from the Town Hall in Mulberry Place to Mile End Park on March 28 last year? As the Tories point out, the 277 bus would have taken her there directly…in 15 minutes. For £1.35. And how else to explain a return trip from her home to Hackney Town Hall for £76 last May? On June 20, she even billed us £20 for a taxi from Mulberry Place to Mulberry Girls School, where she is a governor. Let’s hope it was in relation to her role as cabinet member for housing. 28.3.12 £120.63 Mulberry Place Mile End Park The 277 Bus goes door to door ! As a break from the daily grease of Tower Hamlets politics, here’s some lighter news. As I’ve said before, one of the borough’s main delights is its history and any effort to preserve and commemorate its heritage deserves applause. Over the past 17 years, the Rev Philippa Boardman, one of the first women to be ordained as a Church of England priest, has been helping to restore and renovate St Paul’s Church in St Stephen’s Road, Bow/Old Ford. It had been closed, almost derelict for five years when she arrived in the parish in 1996 and rather than let it fall into the hands of property developers, she set about rebuilding work. With a fabulous modern interior designed by Matthew Lloyd Architects, it reopened with the help of various grants in 2004. It now has a thriving, lively congregation on Sundays, while during the week it acts as a community venue and coffee shop. The brilliant Ability Bow gym, which, scandalously, has been struggling with funding cuts, is also upstairs. Local Church Wins Funding to trace its History. St Paul Old Ford has been awarded £10,000 from the Heritage Lottery Fund ‘All Our Stories’ programme to tell the story of the church and how it has served the whole community since it was built in 1878. The funding will enable the church to work with tutors from York University who will teach sessions on ‘how to do online research’ and ‘how to store and archive historic records’, and the end result will be a touch screen with all kinds of information about the church and local community, a phone app and a church trail for children. 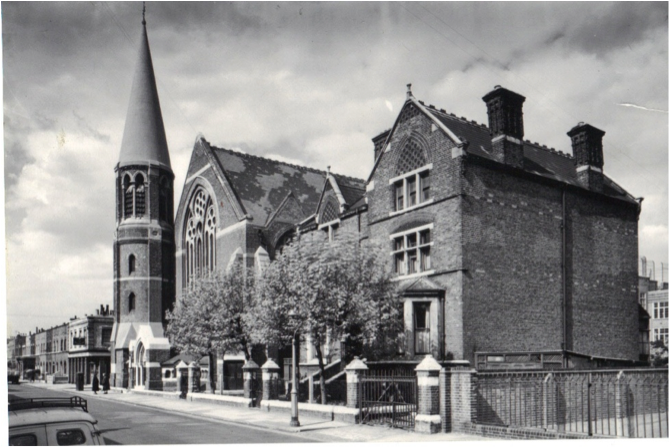 As part of the research, St Pauls is eager to meet East Enders (including those who have moved away from the area) who have old photos of St Paul’s or photos of activities held here. If you have photos but can’t come on that particular Friday please do e-mail Karen Diss the St Paul’s Venue Manager or phone her on: 020 8981 4655. Vicar, Rev Philippa Boardman who received the MBE in 2011 for services to Heritage in East London commented: “We are delighted to have received this funding from the Heritage Lottery Fund. St Paul’s serves the local community here on a daily basis through the Gym, Educational centre, Café, daily Prayer and all the other activities. When we won a couple of awards at the East London Advertiser a few years back, we sent a cheeky press release about our achievements to Tower Hamlets council’s East End Life. “Local business wins national awards,” was its gist. Slightly embarrassingly, I can’t remember if they ever published it (I seem to recall they did, but that might well owe more to my high regard for its editor, Laraine Clay, than any reality). Bow resident Ted Jeory has been shortlisted for the prestigious Paul Foot award for his Trial by Jeory blog about Tower Hamlets politics. The award was set up by Private Eye and the Guardian in memory of Foot’s passion for campaigning and investigative journalism. Ted, who is also the Home Affairs Editor for the Sunday Express, has been named on a shortlist of eight campaigns, with the winner due to be announced on February 26. He established the blog in 2010, two years after leaving the borough’s main local newspaper, the East London Advertiser. Since then, it has established a solid fan base, including Mayor Lutfur Rahman who regularly refers to it in the council chamber. It also features regularly in Private Eye, which highlights stories about council spending and expenses claims by senior town hall officers. Eight campaigns are on the shortlist for the Paul Foot award, set up by Private Eye and the Guardian in Foot’s memory: Tom Bergin, Thomson Reuters (for reporting on tax avoidance by Starbucks); Jonathan Calvert, Heidi Blake, Sunday Times (ex-generals lobbying for MoD contracts); Ted Jeory, Trial by Jeory blog (politics in one London borough); Alexi Mostrous, Fay Schlesinger, the Times (tax avoidance schemes); Claire Newell, Graeme Paton, Holly Watt and Robert Winnett, Daily Telegraph (exam boards); Andrew Norfolk, the Times (sexual exploitation of teenage girls); Rob Waugh, Yorkshire Post (scandals involving local police and Acpo); and Stephen Wright, Daily Mail (15 years’ coverage of the Stephen Lawrence case). Judged by Brian MacArthur (chair), Clare Fermont, Bill Hagerty, Ian Hislop and Alan Rusbridger, the £5,000 award for investigative and campaigning journalism will be presented on 26 February, with £1,000 going to each of the runners-up. The judges also longlisted and commended: Kaya Burgess, the Times (Cities Fit for Cycling campaign); David Cohen, Evening Standard (Ladder for London campaign aiding young unemployed); Gareth Davies, Croydon Advertiser (Lillian’s Law anti-drug-driving campaign); Ed Hammond and Caroline Binham, Financial Times (the SFO and the Tchenguiz brothers); and Harry Wilson and Richard Tyler, Sunday and Daily Telegraph (interest swap mis-selling).